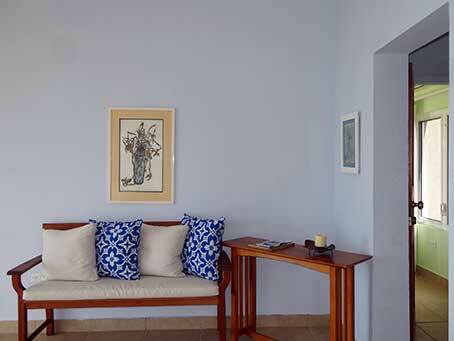 There are 5 en-suite bedrooms, situated in 2 buildings and linked by the pool terrace. 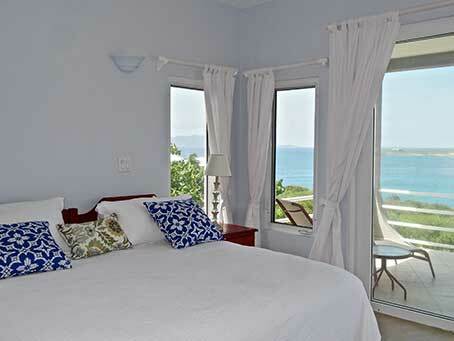 All bedrooms have ocean views, private balconies, air conditioning and ceiling fans. There are beds for 11 persons. With the addition of rollaway beds and cots the villa can comfortably sleep 16. 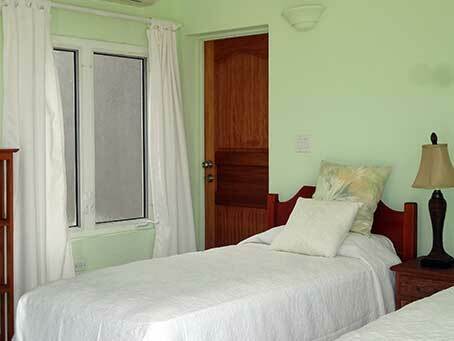 We have floor plans available, and are happy to advise you on the best configuration of rooms/beds for your stay. Master Bedrooms 1 & 2 occupy the top floors and have king-size beds. Both have room for a rollaway beds and/or cots. 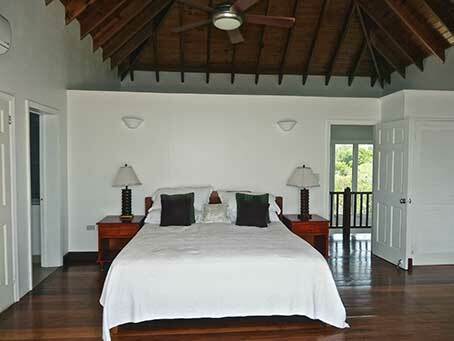 The master bedroom on the second floor of the Main villa. 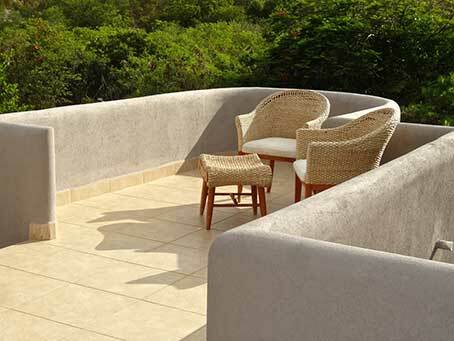 The balcony of the master bedroom in the Main Villa with spectacular views of St. Maarten. Master bedroom #2 on the top floor of the Guest villa with its private balcony. 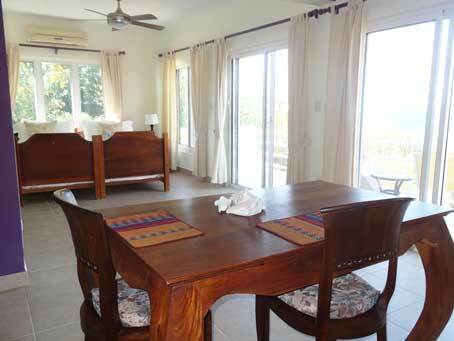 Private space on the second floor of the Guest villa ideal for a drink after a day at the beach. 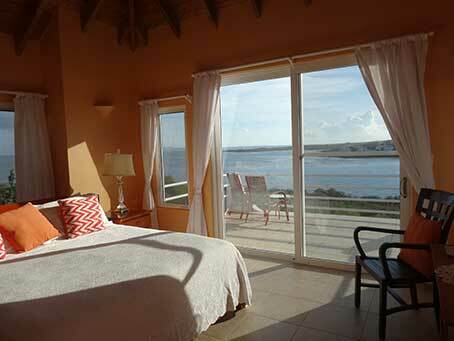 Bedrooms 3 & 4 are at pool level of the Guest Villa. They can be set up with either king- size or twin beds. Bedrooms 3 & 4 can interconnect if you wish. Bedroom 3 - Blue room with king size bed, convertible into twin beds. Bedroom 3 - A seating area in the blue bedroom next to the door that connects with the green bedroom. Bedroom 4 - Green room, set with twin beds convertible to king. The wooden door connects to the blue room. It may be left open or securely locked from either side. 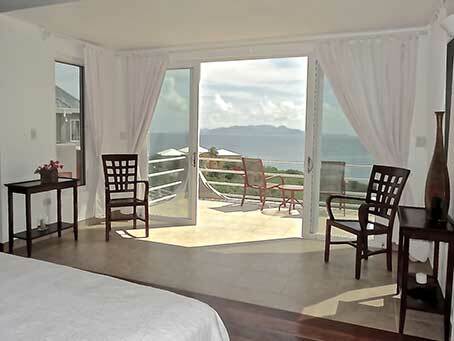 Bedroom 4 - Sliding glass doors lead onto the terrace and offer panoramic views of the Caribbean. Bedroom 5, the "apartment," is a very large room on the entry level. It can be set up with either king-size or twin beds. This room has a couch that converts into a bed, a kitchen and a dining area. 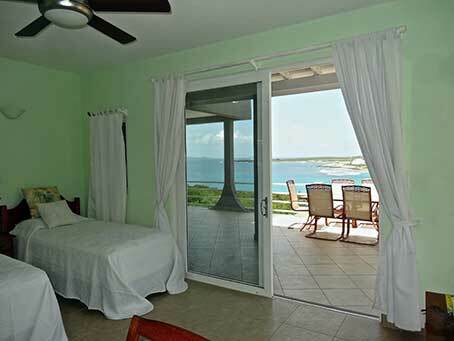 Bedroom 5 - Spectacular views of Sandy Hill Beach and St. Martin. The twin beds are shown in a side-by-side configuration. 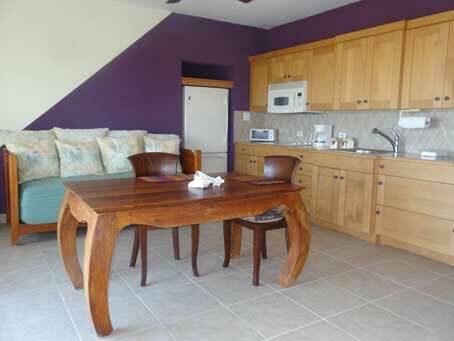 The dining table seats up to six people. Bedroom 5 - View of the fully equipped kitchen, convertible couch and dining table.